"...excellent and varied collection ... the detail given is authoritative and knowledgeable... thoroughness, clarity and common-sense." - Fortean Times on The Ghost-Hunting Casebook. Following a formative childhood meeting with the soul of her recently-deceased grandmother, Natalie Osborne-Thomason's consuming interest has been to research and write about ghosts. As a natural psychic, she is blessed with the gift of being able to deepen this quest beyond the capacities of most ghost-hunters, allowing her to sense, perceive and experience what many cannot. Following on from her acclaimed Ghost-Hunting Case Book, in which the author catalogued cases of hauntings, Psychic Quest features her many personal experiences of ghosts and her own search for answers. 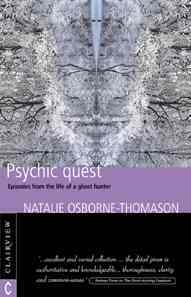 Interlaced with autobiographical glimpses, Osborne-Thomason tells of psychic episodes and ghostly encounters, including her meeting with the ghost of Pengersick Castle and the haunting spirit of Woodford church. She also tells of clairvoyant intuitions in Jerusalem, how she prevented a car crash, her opportunity to read the President's palm, the delights of overnight vigils in musty locations, and much else besides. In her thoughtful conclusion, the author suggests a solution to the mystery of ghosts, and indicates how ghosts might manifest. She also gives a list of ghostly locations for would-be ghost-hunters. NATALIE OSBORNE-THOMASON was born in Harpole, Northampton, England. A mother of three children and a natural psychic, she is an author, lecturer and researcher, and also gives personal readings. Since childhood she has been fascinated by the subject of ghosts, and has spent much of her spare time gathering information and first-hand experience. She has made numerous media appearances which include a feature in The Daily Mail and the television programmes This Morning (with Richard and Judy) and Esther (with Esther Rantzen). She is the author of The Ghost-Hunting Case Book and Walking Through Walls.